I’ve had lots of inquiries recently about finishing cutting boards and wood countertops. This has surprised me because I thought this issue was widely understood. • Will the cutting board or countertop be used for cutting? • Is the countertop away from the sink? • Is the countertop next to the sink? 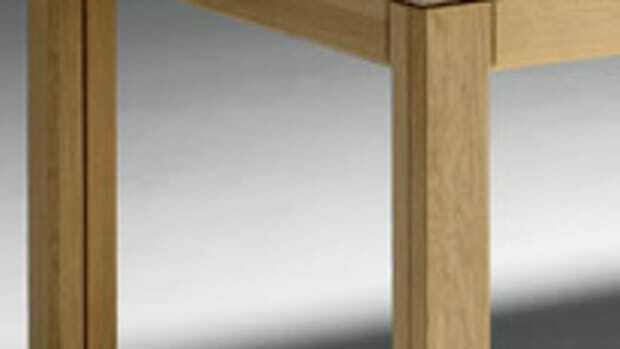 Other than decoration, the primary purpose of a finish is to keep liquids out of the wood. Liquids can stain wood, of course, but stains can usually be removed with soap and water, or by scrubbing with an abrasive cleanser such as Ajax or a bleach such as OxiClean. In the worst cases, you can sand the wood or bleach out black marks with oxalic acid. Much more destructive than stains is the constant wetting and drying out of the wood over time. This causes warps and splits that are very difficult or impossible to repair. Take a wood deck as the most common example. The deck boards get wetted on the topside, but not the bottom side, every time it rains. And they dry out in between. After a year or two, every board in the deck has cupped (no matter how the boards were laid — heart side up, sap side up or quartersawn). After a few more years, splits start appearing in the topside of each of the boards. The splits might be small, often described as “checks,” or they might be large. They develop because the shrinkage and cupping caused by the wetting and drying out becomes so great that the cellulose fibers can no longer hold together. The same cupping and checking occurs on tabletops with old deteriorated finishes that get wiped down with a damp cloth after meals. (This is the primary reason these tabletops should be refinished when the old finish deteriorates). With this introduction, how should cutting boards and wood countertops be finished? If the wood will be used as a cutting board or if it is a countertop that will rarely — if ever — come in contact with liquids, there’s no reason the wood has to be finished. I recognize that many people think they need to finish cutting boards, but this isn’t true. Left unfinished, the cutting board will eventually warp and glued-up boards could begin to separate, but cutting boards usually have a limited lifespan anyway. To deal with the warping, simply turn the board upside down every periodically and the warp will flatten out and then reverse. In cases where you’re making cutting boards for sale, you might want to give the wood more color. If so, you can finish the wood with mineral oil (as explained in the next section). For countertops, I use my own experience to prove they don’t need a finish if they aren’t exposed to liquids. I have two maple butcher-block countertops opposite the kitchen sink that are 35 years old and have never had a finish applied. They are in perfect condition. Spills occur once in a while, of course, and when they cause a stain I scrub it out with a cleanser or bleach. Finishes that don’t build on the wood include oils and waxes. There’s no build because all the excess has to be wiped off after each application or the surface becomes sticky, smudgy and dirty. A non-film-building finish is the only one you should consider for objects such as cutting boards and countertops that will be used for cutting. Besides how ugly a built-up finish will quickly become, you don’t want chips of finish getting into the food. Butchers have traditionally melted paraffin wax into the end-grain tops of their butcher-block cutting tables and scraped off the excess. You or your clients could do the same with cutting boards, but few people want to do this. Most would rather use oil. Upkeep is important with any oil finish because the surface dries out. But mineral oil is not waterproof. Water will get through, especially after several days or weeks of use. The test to prove this is simple. Sand some new wood, then apply mineral oil and wipe it off after a few minutes. Next day, drip some water onto the surface and leave it for several minutes before wiping off. You can feel the raised grain, proving that water gets into the wood. The best you can do with mineral oil is apply it again whenever the wood begins looking a little dry. It’s not a fixed time because people differ in their use of these surfaces. The bigger problem with mineral oil is that people rarely keep up the applications. As an alternative to leaving the wood unfinished or oiled, countertops away from the sink — and not used for cutting — could be finished with any finish you choose. It’s the same as finishing any tabletop surface. 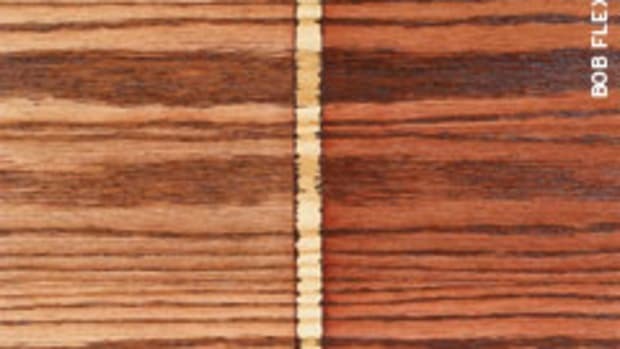 Water-based finishes and some high-performance finishes such as conversion varnish leave the wood looking the most natural color. Other finishes darken the wood (called “yellowing”). Satin and flat finishes, especially when applied thin, leave the wood looking more natural than gloss finishes. The serious problems with wood countertops come when they are installed next to a sink. Water sits on top of the surface and, much worse, gets on the end grain next to the sink or underneath it. If the water can find its way into the wood, it will cause problems — and eventually, water is going to find a way in no matter how the wood is finished or how well the finish is kept up. If water gets into the wood, it will cause warping, splitting and board separation, especially in from the end grain, as described above. If the water gets underneath a film finish, it will cause the finish to peel and it will probably cause black stains. The better surfaces to put around sinks are plastic laminate, granite or some substitute. If clients insist on using wood, warn them of the problems and finish the wood as they want. 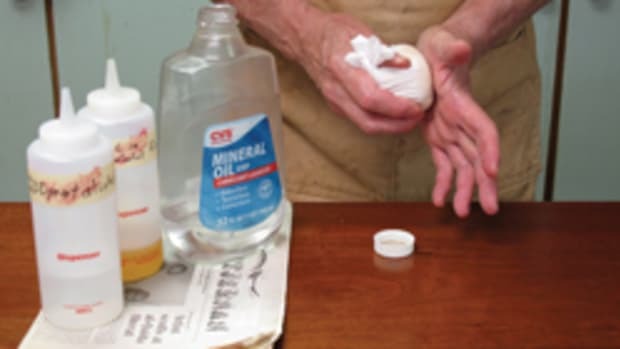 If mineral oil, instruct them to keep up the treatments whenever the surface begins looking dry. This is the best you can do.